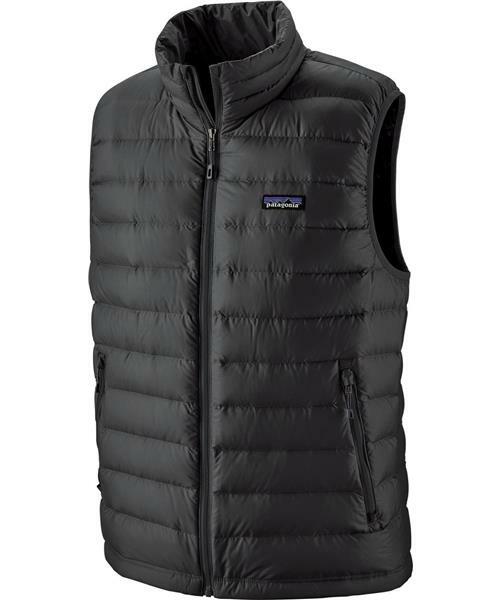 Worth its weight in gold when the sun dips below the horizon, Patagonia's Down Sweater Vest keeps its focus simple: core warmth. It traps your hard-earned heat with high-loft, 800-fill-power 100% Traceable Down (European goose down that can be traced back to birds that were never force-fed, never live-plucked)and its minimalist design practically floats – it’s so compact that it stuffs into an internal pocket (with a carabiner clip-in loop). The 100% recycled polyester shell with a DWR (durable water repellent) finish provides wind and weather protection as well as high tear-strength, while quilting lines stabilize the down and accentuate the contoured fit. The drawcord hem tightens from inside the zippered handwarmer pockets, and nylon-bound elastic armholes seal in heat. * Shell: 1.4 oz 20 x 30 denier 100% recycled polyester ripstop with a DWR (durable water repellent) finish. * Lining: 1.5 oz 22 denier 100% recycled polyester ripstop with a DWR finish.